Ahoy - Mac's Web Log - Joseph Lee, did he desert US Navy's Great White Fleet? Over many years I have been researching family history and one person has really stumped me. He is not a direct relation but he certainly is an interesting one. Joseph Lee was my husband's step-great grandfather. My husband's father lived with him for some time as a child. He was described as a yank who jumped ship sometime in the early 1900's. I am wondering if he might have been a deserter from the Great White Fleet in 1908. He married Margaret Annie King (nee Medwin) in 1920. The family said that he was from the US and that his family regularly sent money for him to return home. He would take the money and go on a bender returning to his wife in Koo Wee Rup about two weeks later. He was a handyman and painter who worked all around Koo Wee Rup until the mid 1930's. I have articles about the Koo Wee Flood (where many people lost their lives) and Joseph survived by climbing onto a roof. The man next to him couldn't hold on and perished. Joseph seems to disappear after 1937. His wife died in 1938. I cannot find any other information about him. My husband's father and grandmother both described him as a gentleman with a wonderful and kind way about him. Despite his little drinking problem it seems that they loved him very much. I find it frustrating not to have any information about what happened to him. I am hoping that you may be able to steer me in the right direction. 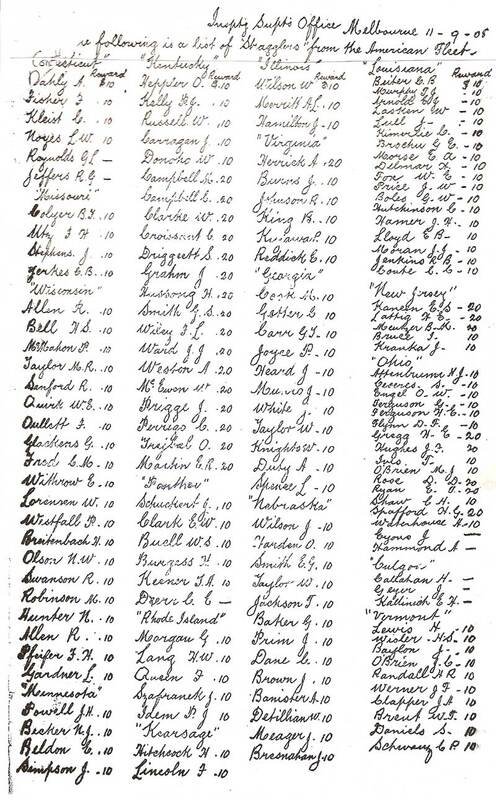 Here is the list I have of US navy deserters from the visit of the Great White Fleet. see "Deserters from Great White Fleet in Melbourne September 1908"
Joseph Lee is not on this list. I cannot find any details for him.